Suitable for children between the ages of six and twelve, this is an educational game designed to enhance a child's history and geography knowledge. 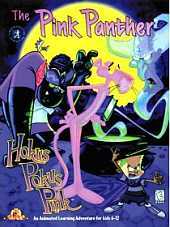 While dabbling with powerful magic, a young boy accidentally transforms an innocent girl into a giant wombat, and it falls to the Pink Panther to find Dr. Strangeblood's book of spell reversals so that he can undo the transformation before it's too late. Armed with a PDA that contains information on the indigenous people, languages, clothing, entertainment, art, history, nature, and foods of each pertinent area, players must guide Pink on a quest that will span six countries across the globe. As they make their way through locales such as Greece, Indonesia, Israel, and Kenya, players will need to find objects that can be used or traded to acquire items crucial to solving the mystery. It features ten original songs and over 300 fact-filled pages containing information and photos of the countries in which players find themselves.